Justice League – Meh. Just … meh. I wish I could offer something more on this title, but it’s leaving me bored. Might be time to drop it from my pull list soon, but I’ll finish the current arc first. Gotham Academy – I hate to say this because I was hoping for so much more, but the writing on this title has let me down. It’s not BAD—it’s just … a little slow? The pacing is dragging for me. And it’s perfectly reasonable that many others would love the type of story they’re telling in Gotham Academy, but for me personally, it’s not hitting. I anticipated giving the book at least the first full arc to grab me, but I think I already know that it’s not going to fit. And that’s really a shame, because I LOVE the artwork on this book. Karl Kerschl’s style is so clean and so lively, and even more exciting when you throw on Geyser and Dave McCaig’s incredible colors—I wanted so badly to fall in love with this book. But I’m just … not. Hawkeye – Umm … so, this title is coming back, right? Because I need this title. This title has to exist. 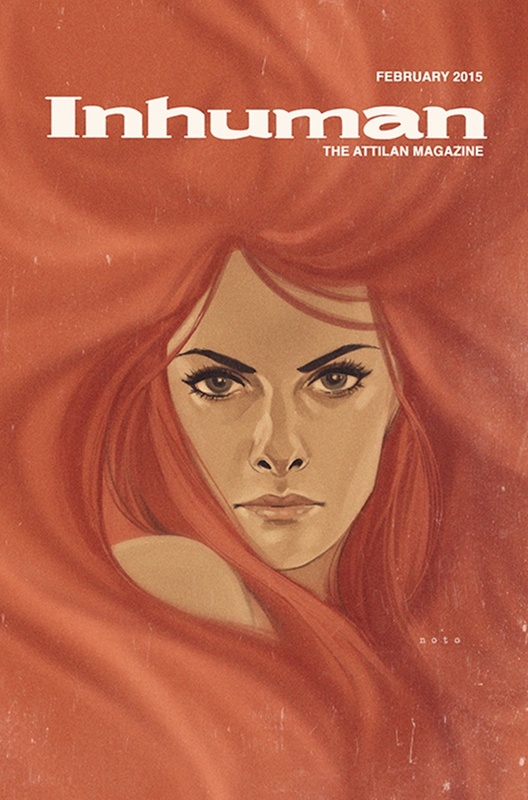 Phil Noto’s variant cover for the February issue of Inhuman. Black Widow – Natasha/X-23 team-up? Yes, please. More, please. Also, my goodness, I cannot explain my love for Phil Noto in any sufficient way for others to fathom. He is just … I can’t. I love his work so much, it’s unlike anything else. I can’t compare him to anyone. And Marvel just announced that they’re releasing a month’s worth of Phil Noto variant covers in February, which means I’m trouble and will be buying way more titles that month than I need to be…. Thor – LOVE. LOVE, LOVE, LOVE, LOVE, LOVE. Three issues in and I am OBSESSED with this book. Everything about it is solid; the writing is spectacular, the artwork is a delight, the colors are captivating. There is nothing more I could possibly want from this, and I’m so excited for the next issue. Superman/Wonder Woman – This title was actually fairly decent under Charles Soule—it was better than what I was expecting, and Tony Daniel’s art was crisp and lovely. But Tomasi’s first issue as of #13 made this book take a giant nose-dive for me, and Mahnke’s artwork is just not my cup of tea. Wonder Woman’s characterization continues to suffer greatly since the New 52—I don’t know who that person is, but she’s not my Wonder Woman. But that in itself is a topic for a whole other discussion. Sensation Comics – This book. This book is … just about the only thing keeping my DC fandom afloat at this point. If post-New 52 Wonder Woman is wrong, then Sensation Comics Wonder Woman is everything RIGHT and everything she should be. Reading this title is this massive dose of nostalgia, which is kind of weird, right? Because how can something brand new with different, alternative takes on a character make you feel nostalgic toward said character? It does, so very much. I’m not sure I’d do it proper credit in trying to explain, except to say that it’s very clear each writer and artist gets Wonder Woman. They get her and they love her, and that comes through so obviously in every story—which, I’m sad to say, is not the case in her actual title or in pretty much any other DC book she’s currently in. It’s a tragic state of affairs. But if, like me, you want the Wonder Woman you loved before the New 52 destroyed everything she was and everything she stood for, then pick up Sensation Comics. You won’t regret it. This entry was posted on 01/03/2015 by ravenhaired. It was filed under Comic books, Reviews and was tagged with Black Widow, DC, Jason Aaron, Marvel, Phil Noto, Sensation Comics, Thor, Wonder Woman.